The red-brick laden county of Warwickshire lies in the heart of England, protected and flanked on all sides – ensuring its certain status as a land-locked county. Famed for its ancient forest and natural beauty, the nature and role of Warwickshire has changed dramatically in the recent centuries which have passed. In Belsey there is evidence of a once leafy and sleepy sort of place, transformed into an industrial regional power-house. Travel the short distance with a prok and stuffing roll in your hand to Coventry in order to witness one of the strongest industrial sectors that Britain had at one time. When we serve our hog and spit roast catered food, it is clear that the people of the Warwickshire region love it. This is due to an organic link to the important aspects of family life. Working hard through the Industrial Revolution and continuing to do so ever since, the people of Warwickshire know the importance of meal-times; which is why they love it when the food exceeds their expectations. Which ours always does. Travel to Alderminster and Stoneleigh in order to host your hog and spit roast catered event and you are in for a real treat – as this area is stunningly beautiful, as is the case with the ancient Forest of Arden. The Forest used to occupy a huge amount of territorial area within Warwickshire. However, with the increased levels of industrialisation in the area, the majority of this was cut up and utilised for fuel in order to power Britain’s industry into the stratosphere. Blackheath is a lovely place for a corporate event – excellent for sealing the deal with a hog and spit roast event – at any time of the year, indoors or outdoors. Each of our locally sourced, British hogs takes between three and four hours to roast, and can feed between two and three hungry mouths. If you are looking for a hog roast in Alderminster, Stoneleigh or in the Forest of Arden, we arrive at the location of your event in plenty of time and discretely set the hogs roasting at an appropriate time, depending on what time you want to eat. Once feeding time arrives the roast is carved by our experienced chefs and served up fresh, straight from the spit. Taste the Cracklin are totally flexible whatever you need we will do our very best to supply. If you want to complement the hog with other meats, we can spit roast beef, chicken, turkey, venison … or any other suitable roasts. Taste the Cracklin supply the meat, and deliver them in our refrigerated transport units to ensure optimal freshness. The meat is all locally sourced, the best of British, so that you can be sure you are supporting your local farmers too. You may simply want us to supply the meat, or you may want us to go the whole ‘hog’ and bring along the salads, breads, condiments too. Have a look at the different menus that are available and choose the one that suits you best. If you want any changes we would be happy to make some changes to the menu to suit you. You may have special dietary requirement – and we can cater for that too. Why not also try our scrumptious sage and onion stuffing, and our home made apple sauce a hog roast is just not the same without it. Even before they taste the meat, your guests will be impressed and the smoky smells will have their mouths watering. When they come to take the first bite into this juicy hot meat barm they will experience a pleasure never tasted before. This traditional way of cooking for family and friends ensures that the crackling is hot and crunchy, just lightly charred to perfection, and the meat is juicy and succulent. Complement your hog roast with some mulled cider to warm your guests through. Locally sourced cider from the Norrest Farm and Cider Company or from Hogan’s Cider will complement your locally sourced hog. For the children, warm some apple juice to allow them to enjoy a hot fruity drink like their parents. On a cold November evening, as you stand around the bonfire with family and friends, what would be more enjoyable than a hot, succulent barm to warm you to the heart? This traditionally cooked, rustic form of catering is a perfect complement to the crackling bonfire – the smoky smells of the bonfire will be filled with the mouth-watering smells of naturally and traditionally cooked meat. Freshly cooked before your eyes, the hog roasting on a spit will be as much a spectacle as the rockets, whizzers and Catherine wheels. Taste the Cracklin are finding that year on year the demand for this rustic, naturally roasted food is growing. People just love to stand around the spit and watch the crackling fire. The heat off the glowing embers provides extra warmth on those cold, dark November evenings. 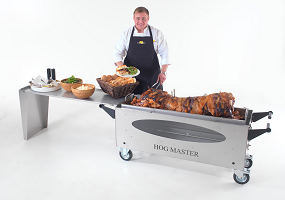 A roasting hog is the ideal way to cater for any bonfire event no fuss, no bother, no mess. Your hogs, roasting machines and experienced spit roasting chefs are all supplied for you to ensure your bonfire is a great success whether it is a small family gathering, a community event or a firework spectacular to which the whole town is invited. We would be honoured to provide a hog roasting service for your event. We cover the whole of Britain, with a local subsidiary close to you to ensure that we can deliver to all corners of Warwickshire so wherever you live, we are available. Once your guests are fed and content, we will discretely pack away the roasting machine as they gaze at the fireworks. By the time the rockets have stopped whizzing into the skies and the bangers have stopped making your guests jump, we will be packed up, cleaned up, and on our way. You won’t even notice us leave. If you have a bonfire or fireworks planned for this Guy Fawkes, or maybe a summer bbq give us a call and find out how we can cater for your event. It doesn’t matter how big or small, we can cater for events of all sizes.